Today I decided to share our Save the Dates on the blog, because they crack me up! Even though we had professional engagement pictures taken, we knew we wanted to do something fun, exciting and different. Steve grew up slalom water skiing on the Ocean (so he's a lot better than me) and I grew up slalom water skiing my Summers away on a Lake in Maine. We figured why not do something a little wacky and different? After all who wouldn't want to look at my hot bod in a bathing suit on their fridges for the next 6 months? It took us a few times to get a good shot off us both holding the sign. As you can tell, we didn't have a professional photographer with us and the lake was extremely choppy this day, so it was pretty difficult to coordinate. We ended up photo shopping the date on the sign, because the supplies I bought didn't work. Unfortunately, we were on a lake in the middle of nowhere with no craft or hardware stores close by, so we had to improvise. How cute is your Save the Date?! I love water skiing! Congrats on your engagement! 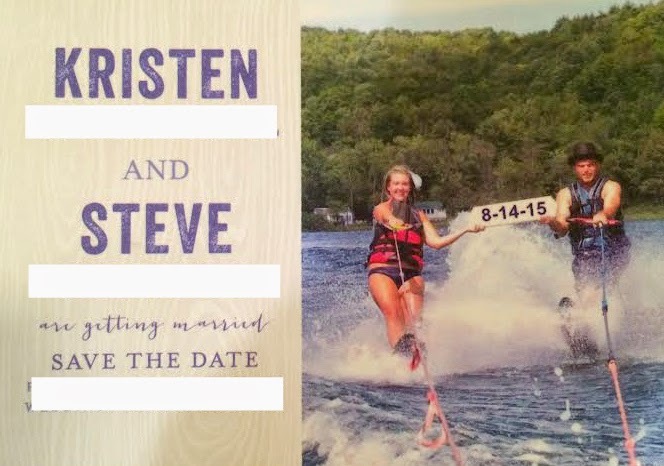 LOVE that Save the Date! So creative! !